Today I'm gonna talk about cloth diaper experience. Ever since my friend introduced me to cloth diapers, I have been a huge fan of it for numerous reasons. One, because I love the environment. Do you know how much landfills are made up of dirty diapers? Can you imagine inheriting those landfills to your kids? I can't. I want them to have a clean, good environment to live in when they grow up. Two, because in the long run it saves us a lot of money. Three, because it's available in various cute colours *coughcoughpurple* Four, the modern cloth diaper is designed in practical manner and can be used from newborn to toddler age. Last but not least, it's so easy to use and to clean - gone are the days when cloth diapers need to be hand-washed separately to remove the soils and urine. 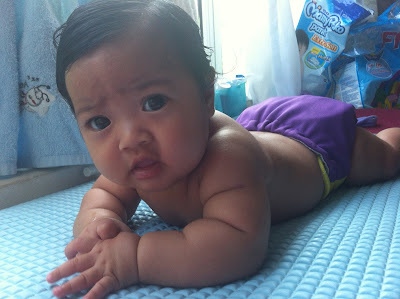 Basically, switching to cloth diaper is not tedious at all and therefore, suits my busy lifestyle. Ever since I was pregnant with Khadeeja, I've made up my mind to use cloth diapers on her on daily basis. The disposable diapers are only reserved for long outings (which I intend to change soon and try using cloth diaper exclusively). I chose Lunatots cloth diaper (CD) because I love their practical design that enables the CD to grow with the baby - their adjustable buttons are the trick. Isn't that clever? Secondly, most diapers are designed to have inner inserts. Lunatots Premium CD have outer inserts that are easily removed for cleaning and only need to be clipped onto the outer layer for use. Read more on my reviews of their CD here and here. 1. Cloth diapers are expensive! Disposables are cheaper in the short-run. Do I really save a lot if I switched to cloth diapers? For moms who find the initial investment quite intimidating (the premium cloth diaper's price sets you back by RM69.90 per set), do not lose heart. It may look intimidating now, but the savings that you make in the long run especially when you start early is worth it. For example, after I decided to use CD exclusively, we never found the need to re-stock Khadeeja's disposable diaper since a month ago. That saves us RM75/month. If she used CD till she's fully potty-trained at the age of 36 months old, we would save roughly RM1302. Some people will say, 'Oh, it's not that much savings! Only RM1302 for 3 years. What's the big deal?' If we put that RM75 to her savings every month, she would have more than that amount since she'll earn dividends and whatnots, don't you agree? Furthermore, if you have two kids using diapers, you can save around RM2k with the same initial investment. Double the savings, parents! 2. But I don't earn that much! How can I buy enough diapers for daily use? 3. Does it leak? I doubt it will last as long as a disposable. I might have to change it sooner than a disposable. Mothers, what are thinking? Do you wear the same sanitary pad all day during your menses? No, right? Why practise differently when it comes to your baby? Disposables might not leak because they have chemical gels to lock the urine, but as it absorbs more urine, the gel will soon get in contact with the baby's bottom and baby ends up with diaper rash. Diapers need to be changed on regular basis whether it's "full" or not anyway. By the way, so far I change the CD every 3-4 hours for 3-month old Khadeeja (unless she poops, of course). That is roughly the same duration of using a disposable. And since the outer layer is water-proof, the CD doesn't leak. Therefore in a day, Khadeeja wears 5 CDs (at night, I put extra layer for her comfort). Besides saving me a lot of disposables, it also means less garbage for us to bring down to the garbage bin, especially since we are living in an apartment! 4. Five CDs in a day? So in 4 days, she'll run out of clean CD and that means more laundry, right? How troublesome. When you are the type that sends dirty clothes to a nearby laundry instead of doing your own laundry, yes. When you don't have a washing machine and instead, hand-wash your clothes, yes. For the first type, having a kid is not advisable. For the second type, get a washing machine! What's wrong with you?? Let the machine do the job while you bond with your kids. For me, every time I change the diapers, I will put the soiled CD in a pail. When the pail is full, I dump everything in the washing machine, fill it up with water and detergent, let the diapers soak for an hour or two before starting the washing mode. If Khadeeja poops in it, I just remove the poo in the toilet bowl, give it a bit of a rub to remove the excess soil, and soak the insert in detergent and just a little bit of bleach overnight before adding that to the washing machine. Remember, I'm mom to 2 kids, and I've done this since I was working and studying, while looking after a young toddler and pregnant at the same time! What's your excuse? All in all, considering the huge benefits of using a cloth diaper, it was a decision that I don't regret. Of course nothing is ever perfect - for example after a while the outer layer velcro tapes tend to wear out and don't stick as good as before. This is because I don't use the mesh bag when laundering the CDs. Lunatots also have another option of buttons instead of velcro tapes. Furthermore, I'm informed that they can help you to change the velcro tapes at a fee if you bring the CDs to their shop. You can even change it yourself. I hope more and more mothers will make the decision to use cloth diapers because saving the environment is not a job for only one mom. I've done my part, so please do your part as well, won't you? yeah let's contribute to save our environment. Klu ko datang melawat dia, boleh la ko geget gegettt je dia ni tapi geget manja je la. Klu tak aku geget ko balik. Hahahaha!